Your wedding is destined to be one of the most important days of your life and my goal is to treat it as such. A wedding is a sacred ritual that symbolizes the love you have for one another, and demonstrates your commitment to your relationship. Planning a wedding should be fun, not stressful! Yes, you have many choices to make: when, where, how big, how small, flowers, cake, dress, rings, tuxedos, licensing requirements, photography. With over 25 years in the wedding business, I can help you make those all important decisions that will contribute towards making this day the best of your life. Free referrals to everything you will need to make your day perfect! 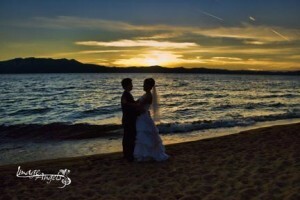 Weddings anywhere in Lake Tahoe as well as the Carson Valley. Weddings on horseback, hot air balloons, sleigh rides.